The Instacart delivery service has created 2,800 jobs, according to Publix. Publix has defined its relationship with Instacart as a “collaboration” and on Wednesday said it was “strengthening its relationship” with the app-based delivery service. The grocer promotes the Instacart service with signage throughout its stores and has a section devoted to the service on its website. Publix’s relationship with Instacart sets it apart from Shipt, a similar app-based delivery service that began offering Publix delivery in 2015. 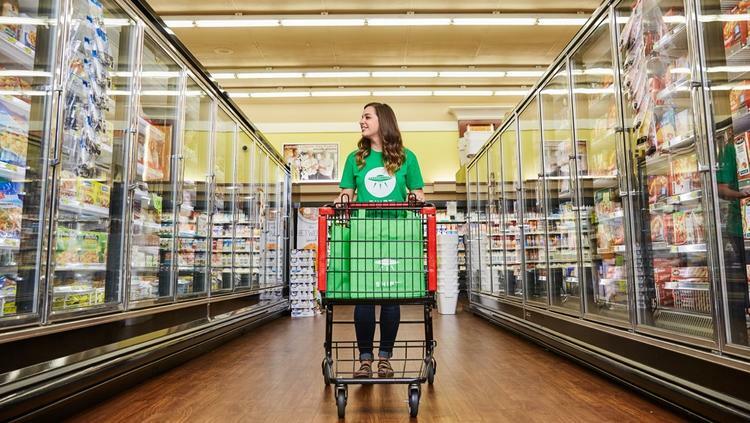 Shipt has green-and-white branding that is similar to Publix’s own logo, but there is no formal relationship between the two. Publix’s decision to offer delivery services from all of its stores represents a major investment and a watershed moment within the grocery industry. Publix is known in grocery and real estate circles for the data it collects and analyzes. Instacart also has the ability to mine data from customers, and the fact that Publix is doubling down on delivery means the Lakeland grocer sees a profitable future in the service. Wal-Mart Stores Inc. and Kroger Co., Publix’s two biggest competitors, have been rapidly expanding their click-and-collect services, in which customers order online and have items brought directly to their cars. The Instacart delivery service goes a step beyond that with home delivery, and it also sets Publix up to compete with Amazon.com, which is laying the groundwork to be a major player in the grocery realm, as well as Jet.com, the e-commerce company Walmart acquired in September 2016. Jet.com has a grocery platform that the company has been rapidly expanding throughout the Mid-Atlantic. Walmart is also piloting a program in New Jersey and Arkansas in which employees deliver items on their way home from work. Florida (Daytona Beach, Fort Lauderdale, Fort Myers, Jacksonville, Melbourne, Miami, Naples, Orlando, Sarasota, St. Petersburg, Tallahassee, Tampa and West Palm Beach), Georgia (Atlanta), South Carolina (Columbia), North Carolina (Charlotte, Durham and Raleigh) and Tennessee (Knoxville and Nashville). Story by : Ashley Gurbal Kritzer at the Tampa Bay Business Journal. This entry was posted in Produce News, Tampa Lifestyle and tagged Grocery, Publix, reedtms on June 8, 2017 by ReedTMS. Shipt, an app-based grocery delivery service, is rolling out Costco Wholesale Corp. (NASDAQ: COST) delivery in Tampa to make bulk shopping more accessible to customers for whom convenience trumps grazing on free samples. Tampa is the first market in which Shipt is offering Costco delivery, a spokeswoman said. Instacart, which launched delivery services in the Tampa Bay region in October, already offers Costco delivery here. The Shipt app requires a membership, which costs $99 annually. Shipt members can order groceries via the app and have them delivered to their home in as little as one hour. Shipt debuted in the Tampa Bay region in July 2015, offering delivery from Publix Super Markets Inc. Despite its green-and-white branding, there is no official relationship between Shipt and Lakeland-based Publix. In this market, Shipt also offers delivery from ABC Fine Wine and Spirits. Online grocery shopping is becoming more prevalent in the Tampa Bay region. In 2016, Publix launched what it calls a ” collaboration” with Instacart, pushing deliveries via that app in signage throughout its stores. Wal-Mart Stores Inc. offers online grocery shopping with curbside pickup in several locations throughout the Bay region and Central Florida. This entry was posted in Tampa Lifestyle on March 21, 2017 by ReedTMS.